Your welcome mat is not a secure key hiding place, neither is the frame over your door or the suspicious foam-rubber "rock" lurking suspiciously next to your stoop. You might as well leave your doors unlocked. Instead hide your spare where nobody will ever think to look—right out in the open. 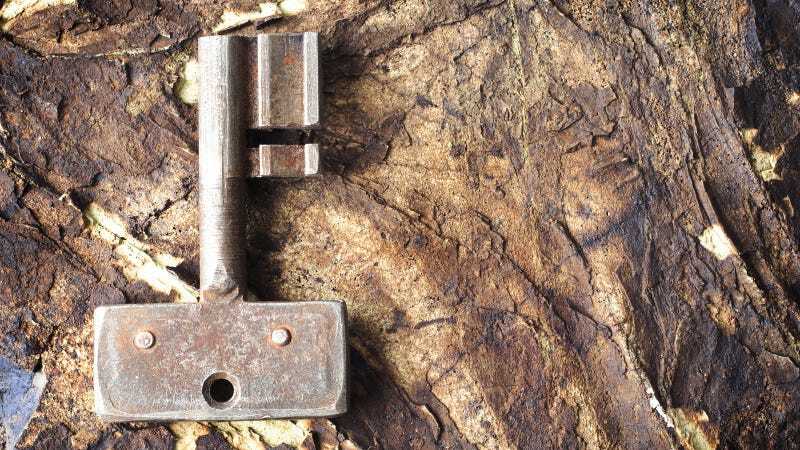 Assuming you've already undertaken other basic home security measures—installing an home monitoring system, motion-activated exterior lights, visually unobtrusive hedges, a small dog with a big bark, etc—you can easily mitigate the risks of stashing a spare key somewhere on your property. Time is of the essence to a potential intruder—the longer he fumbles about, the more attention he attracts—so the goal here is to waste as much of his time as possible before your other home security measures come into play. The Challenge Fastball of Home Security: Key vaults are small, weatherproof boxes secured with a combination or electronic tumbler and are used extensively in real estate for storing open house keys on-premises. Problem is, key vaults practically dare would-be burglars to smash them open and retrieve their contents (quickly followed by the contents of the house). This makes key vaults big, obvious, valuable targets to burglars and, therefore, awesome decoys. Don't put your house keys in there silly, put someone else's—preferably someone that lives across town and has an identical key vault containing your house keys. Or just a dummy set that doesn't open a damn thing. Keys on a Wire: In addition to being fast, a burglar must be stealthy. Cracking open a key vault can be done quickly and quietly but is nearly impossible when retrieving a potential spare from within a wind chime. Replace the original knocker with a ring of house keys (all but one of which should be dummies). Robbers will either have to waste time carefully removing the key ring or risk waking the neighbors with the clatter of chimes. Of course, hanging multiple chimes with multiple keyrings only multiplies the effect. The Dead Key Drop: Nothing says you have to keep your spare keys within arm's reach of the front door either. If you've got a free-standing A/C unit on your property or a grill sitting in the back yard, find an inconspicuous spot on it and stash your spare there. It should be tucked away somewhere that isn't obviously visible from someone's standing viewpoint and shouldn't be anywhere within easy finger-swiping reach. Use a dot of super glue to affix a neodymium magnet to your key and hang it from an interior surface or the inside of the grill leg. If you live in a high-rise apartment, the rolled fire hose sheds in the hall are great places to stash a key so long as it doesn't interfere with the operation of the hose stations—like, say, in the hose nozzle. The Fido Maneuver: Your dog just runs around the back yard all day, might as well put it to use. Affix a small pouch to your pooch's collar and store your spare in there or just clip it to the ID ring. Your dog is given a sense of purpose and your keys are effectively guarded (at least until its loyalty is bought for a few Milkbones). The Key Party: It's not so much hiding a needle in a hay stack as it is hiding a needle in a stack of needles. Take a one-liter wide mouth mason jar. Fill it halfway with key blanks, toss the spare in (it should be a slightly different color or shape from the rest but not so obvious you can spot it immediately), fill the rest of the way with blanks and shake vigorously to mix. It should take both you and and potential intruders a significant amount of time to dig it out—which is the entire point. And depending on how extravagant you want the system to be, there's nothing stopping you from daisy-chaining these together into a trail of home intrusion tears. It may not be as hilarious as what that Home Alone kid did a few years back, but it'll be just as satisfying.